The paper A Global Update of Lead Poisoning in Terrestrial Birds from Ammunition Sources states that lead poisoning in wildfowl and waders from the ingestion of spent lead gunshot has been extensively studied, documented and reviewed over the last half century. They identify two main routes of ingestion: direct ingestion of lead pellets, which look like grit or small seeds, and secondary poisoning among birds that prey upon or scavenge animals that have been shot: primarily raptors, including eagles, hawks, falcons, and condors. Lead poisoning has been documented in 63 species of birds since 1939, including ravens, pheasants and other game birds, owls, rails, gulls, buzzards, kites, eagles, vultures, condors, falcons, red-tailed hawks, white-throated sparrows, yellow-rumped warblers, and solitary vireos. A study of causes of mortality in eagles submitted to the National Wildlife Health Center between 1975 and 2013 found that trauma and poisonings (including lead poisoning) were the leading causes of death for bald eagles throughout the study period. 56% of all eagles admitted to Iowa rehabilitators between 2004 and 2008 had abnormal lead levels in their blood. This ranged from a low of 37.5% in 2004 (with 62.5% of eagles being tested) to a high of 70.0% in 2005 (with 90.0% being tested). 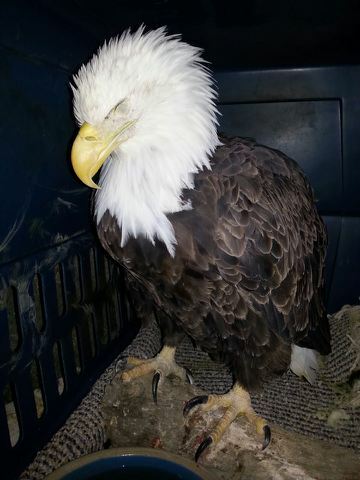 The University of Minnesota’s Raptor Center in St. Paul received 117 lead-poisoned bald eagles during the winter of 2009. In 2012, Dr. Pat Redig co-authored this paper about spent ammunition and lead poisoning in bald eagles. 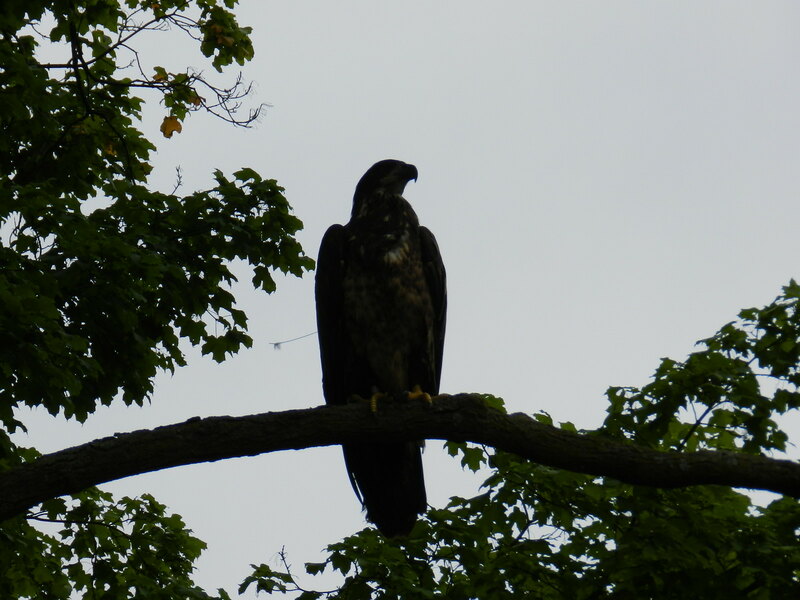 In Canada and the USA, approximately 10–15% of recorded post-fledging mortality in Bald and Golden Eagles was attributed to the ingestion of lead shot from prey animals (Scheuhammer and Norris 1996). Elliott et al. (1992) found that 14% of 294 sick, injured. or dead Bald Eagles in British Columbia (1988 to 1991) were lead-poisoned and an additional 23% sub-clinically exposed. A 2012 study by a team at the University of California at Santa Cruz found that 30 percent of blood samples taken from condors each year showed levels of lead high enough to cause significant health problems and that 20 percent of the free-flying birds required treatment to remove lead. From 1992 to 2012, the cause of death was established for 123 condors in California, Arizona and Baja California, Mexico; lead was responsible for 42 of the mortalities (https://goo.gl/fmK8Ku). Where is the lead coming from? Study after study identifies lead shot as the primary source for lead exposure. In 1991, the US Fish and Wildlife Service banned lead shot in waterfowl hunting, although it can still be used for some other types of hunting, depending on your state's laws and regulations. A survey of ducks on the Mississippi Flyway found that the ban on lead shot reduced lead poisoning deaths of Mississippi Flyway mallards by 64 percent, while overall ingestion of toxic pellets declined by 78 percent over previous levels. By significantly reducing lead shot ingestion in waterfowl, the ban prevented the lead poisoning deaths of approximately 1.4 million ducks in the 1997 fall flight of 90 million ducks. Did the ban on lead shot prevent successful waterfowl hunting? No. The total number of geese and ducks harvested nationwide declined steeply beginning in about 1984, but started rising again in roughly 1992, as shown by this chart: http://flyways.us/regulations-and-harvest/harvest-trends. Requiring the use of non-toxic shot did not negatively impact waterfowl hunting, but did prevent ducks, geese, and many other animals from coming into contact with lead shot by ingesting it directly or feeding on lead-poisoned animals or carcasses containing shot. If you hunt or shoot, please use non-toxic shot. It does your prey well, it does you well, and it does the environment well. We aren’t anti-hunting and we aren’t anti-gun, but handling lead-poisoned eagles has made us anti-lead shot! A five-year long Texas Parks and Wildlife Department study on dove hunting concludes that steel shot works as well as lead. Tom Roster's 2012 non-toxic shot lethality table proves that non-toxic shot can be quite effective and provides helpful information for use. Are lead-free hunting rifle bullets as effective at killing wildlife as conventional lead bullets? A comparison based on wound size and morphology. Copper ammo emerging as the bullet of choice among Minnesota deer hunters. Has reducing lead shot helped birds? In addition to this study on waterfowl, a voluntary program in Arizona and Utah appears to be reducing condor deaths in those two states. We are looking forward to hearing the results from California, which is beginning to phase in a lead shot ban just this year. SOAR: Hunt and fish lead-free. SOAR: Lead in the environment. Hunting Lead Free: A sportsmen’s website promoting non-lead hunting. Give Non-Toxics A Shot! A brochure from the Wisconsin DNR. Good luck with your lead-free hunt! Answers to your four most commonly asked questions, plus a bonus photo at the bottom of the page! When will Mom and Dad start working on a new nest? Did someone mention Eagle Time? In general, Mom and Dad start working on their nest sometime in October. Robin spotted Mom near N2B at one point, but I doubt we'll know whether or not they will adopt it for a month or so. For a time-lapse of the nest, check out this video, pieced together from October 2014 through January 2015: https://youtu.be/Yk19jSED4VE. While nest work started in late October, it didn't really kick into gear until maybe mid-November. What triggers Mom and Dad to start working on the nest? I've got a blog on this subject here: http://goo.gl/658U1y. The short version? Two ideas: Daylight length is quite similar in mid-February and mid-October, which might encourage bonding activities in the photorefractory period that echo those in the photosensitive period, especially between territorial mates. The eagles might be impacted by Zugunruhe (migratory restlessness, which is also influenced by daylight length). Mom and Dad don't migrate, but many eagles do. Perhaps the suite of behaviors and hormones that direct migration in some birds influences our eagles to return to nest-building. Where are the Tree Amigos? What's this about HD cameras? It's true - we are moving to high definition! Cameras will be installed or replaced at N2B and N1 later this fall. Watch for announcements in early October! Who is the eagle in this photo? On this date in 2014, Bob took this photo of Four at the Carlson pond about a mile from the hatchery. This was one of her first 'long' flights and raised our hopes that she might disperse - which she eventually did, although she waited until late October to do so. Look for more 'on this date' photos as we wait to see what the eagles decide to do!